It is only two miles from the dam at Norfork Lake to the White River, but this short stretch packs quite a punch! 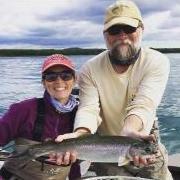 Its waters are the place of fishermen’s dreams, sporting all four species of trout—rainbow, brown, brook and cutthroat. During generation, wading is tough, but access by boat and drifting fishing is excellent. There are several public accesses on the river at low water. Ackerman’s accesses the lower part of the catch-and-release area in the lower part of the river and has premiere fly water for both the novice and the experienced angler.